Hotel rooms are only $115/night, making staying at the convention hotel convenient and cheap (rooms downtown are normally $250 a night!). Having a room means you can be part of the action early, and stay up late! Our ConSweet, which includes free ramen, rice, and soda. Attendees have access to free ramen and soda as part of your admission. 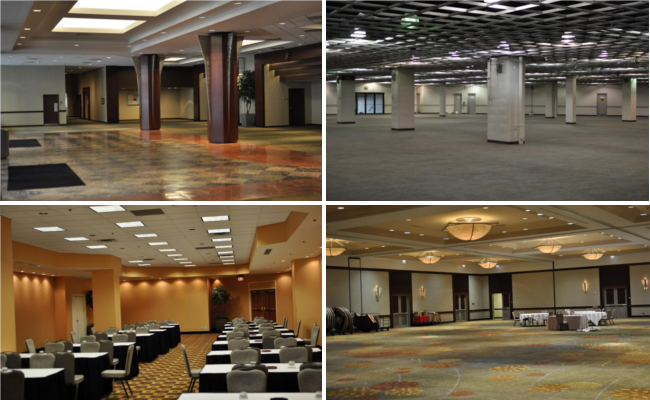 Our main events room will be huge, perfect for an epic rave dance and tons of epic events. All hotel guests even get free wifi! Click here to book your room online. Internet in hotel rooms: Free! You may need to be 21 to book your own hotel room and to check in at the hotel, and you will probably need a credit card. Please note that parking downtown is very limited, and you may have to pay to park in one of the local parking ramps. You can use this ParkWhiz link to find and book nearby parking in advance!